In 10-inch nonstick skillet, cook sausage over medium-high heat 6 to 8 minutes or until no longer pink. Remove sausage to medium bowl. Reserve 1 tablespoon liquid in skillet. Reduce heat to medium. Add bell pepper and onion to skillet; cook 5 to 7 minutes, stirring occasionally, until tender. Remove from skillet; add to sausage in bowl. In another medium bowl, beat eggs and pepper with wire whisk. Add to skillet; cook and stir over medium heat 3 to 5 minutes or until eggs are set. Spray 13x9-inch (3-quart) baking dish with cooking spray. Unroll phyllo sheets; cover with plastic wrap and damp paper towel. Place 1 phyllo sheet in baking dish; brush with melted butter. Repeat 9 times. 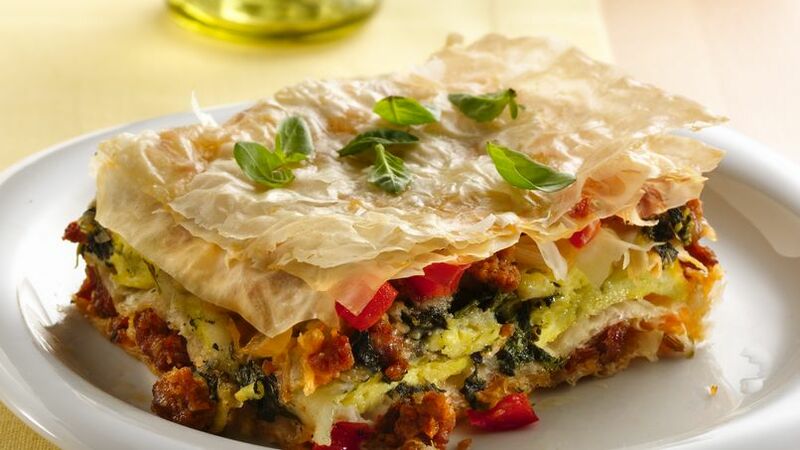 Spread half of sausage mixture over phyllo. Layer and brush with butter 10 more phyllo sheets. Sprinkle evenly with cooked eggs, Swiss cheese, spinach and basil. Layer and brush with butter 5 more phyllo sheets. Top with remaining sausage mixture. Sprinkle with Parmesan cheese. Layer and brush with butter remaining 5 phyllo sheets. Cover tightly; refrigerate 2 to 24 hours. Heat oven to 350°F. Uncover; bake 45 to 55 minutes or until top is golden brown. If desired, garnish with additional chopped fresh basil before serving. Tomato pasta sauce makes a nice topping for this casserole. Serve with a tossed fruit salad. For a healthier version, try substituting the Italian sausage with lean turkey sausage.